So we were trying to think what we should talk about for the first devlog, and then it hit is, the PUPPETS! They are the stars of the show, they are what give our game character and life, how could we not talk about them. We have spent a good chunk of time making our puppets the best they can be. The very first puppet started out as a static image that resembled a lumberjack dude that you can see on the left. However we always had the grand vision of these awesome puppets that actually animated, held weapons, and celebrate when they win battles. So Aaron set off to create a system to piece our puppets together and to make sure we could animate all aspects of them. I set off to make as many drawings of arms, hats, eyes, clothes etc so our puppets looked unique and interesting. The puppet we use now in the game is the one on the right and we are very happy how they turned out. So we finally had our puppet for the game and we were very happy. Our system allowed us to make lots of monsters for the player to battle and make them look different by swapping various parts out between them all. The fantastic thing about our puppets is that no matter what the player decides for the look of his/her puppet, it will work with all the acting that each play requires. So the puppets are created by using lots of little parts and attaching them to the main body, sort of like real puppets. 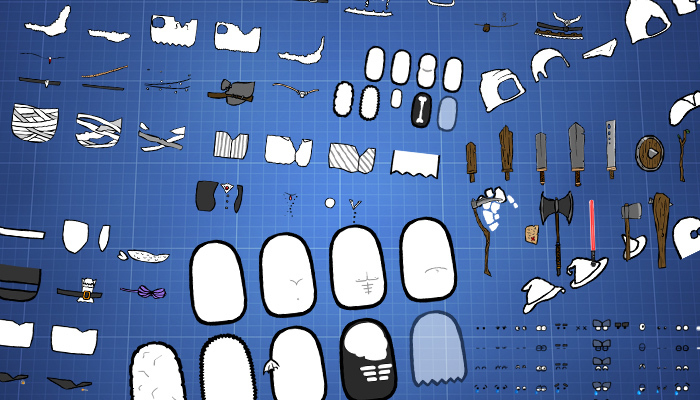 For each puppet part such as an arm or piece of clothing we use spritesheets. You can think of sprite sheets as a giant picture with smaller pictures (such as our puppets clothing) arranged like a chess board. 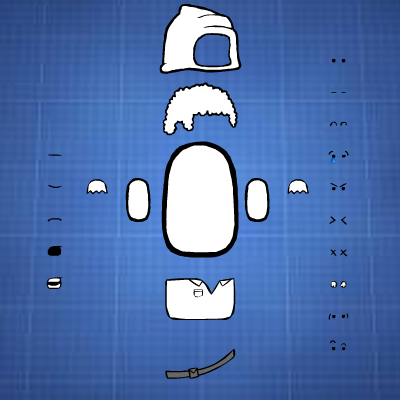 Due to the use of sprite sheets for all of the games puppet costumes we have been constrained in how we go about bringing the characters to life. We have found that the best way for us to achieve this is to give the puppets plenty of facial expression through the use of different eye and mouth combinations. The puppet’s expressive face combined with their exaggerated arm movements (because they don’t have elbows) has allowed us to let the puppets feel animated and expressive without them actually having much in the way of body language; many games that do use character body language just make their characters look awkward, which is something we wanted to avoid. In the initial design of puzzle puppets there was going to only be two characters that the player could choose from (a boy and a girl). We found the system we had created to allow us to include many varied enemies fun and decided to extend the puppet show theme to include the dressing up of the player. Since then we have probably spent as much time creating awesome looking player costumes as we have playing the actual game. So theres an introduction to the stars of the show, a little about how they work and where they started. We will be doing these devlogs every Friday but we would love to hear what you might like to hear included in these posts. We havent gone very techincal atm but there might be other fellow game makers out there wondering what we did and so we can dedicate some posts to explain the more detailed aspects of game making.